S: In one word: Shocking. I sat down with Chelsea for what I thought was a mock design appointment and gave her some insight as to what I liked. We had some laughs over some Little Kings and I generally assumed we were just playing around with her design software and it could potentially become useful in the years to come. I had no idea Kyle would actually be proposing very shortly after! The design process itself was very fun. I felt like I discovered things I liked and disliked about rings that I never even knew myself. I showed her a couple "Pinterest dream" rings and we were able to design the groundwork for what would become my real life dream ring to come. I'm sure it was immensely helpful for Kyle, but like I said, I had no idea this was actually something he'd be laying eyes on anytime soon. I also received a gift card for a manicure from Chelsea for having fun with diamonds, Holla. K: Surprisingly simple. I was able to meet and discuss with Chelsea casually a couple times, so by the time I had a real-life appointment with her, the design was basically complete and we were able to focus our time on fine-tuning the small details. Chelsea also helped me come up with an awesome proposal idea and helped me coordinate it. Basically, Chelsea proposed for me. I just had to get down on one knee and pay her money (not in that order). S: I didn't really get a say but I wouldn't have wanted it any other way! Chelsea is not only my friend and I love that she had a part in my favorite new permanent accessory, but also she puts so much attention in the details! Along with my ring came a beautiful concrete hexagon box, jewelry cleaner, a warranty, etc. But none of these things even came close to the amazing thank you/congratulatory note she sent US after the engagement! 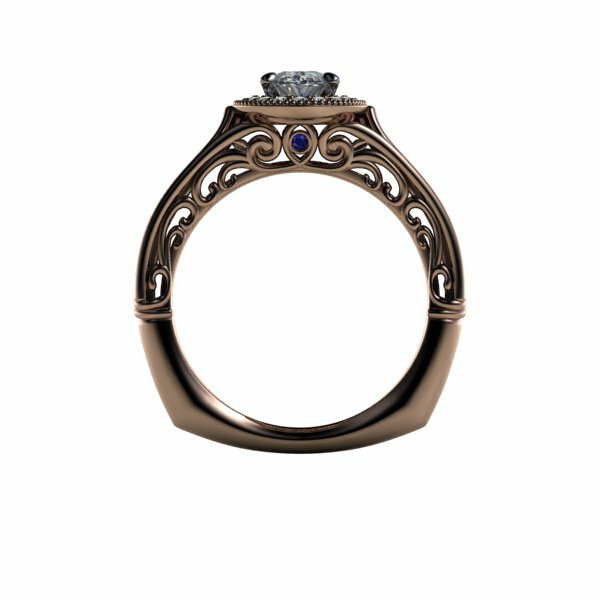 I can honestly say my ring was designed by someone who cares about Kyle and I - which is an awesome feeling. That, and she is wicked talented. K: I chose it because Chelsea is a close friend of Sarah and I, and I knew it would be that much more special if she were the designer. S: Um, the ring. Hi! Right there in my face. Didn't even see it coming. I'm still in shock. Second biggest surprise? My pink haired friend Chelsea hiding in a bush nearby directly after events with a big old cheesin' smile on her face. K: I was surprised by how quickly the finished product was in my hand, ready to go. Also, I was completely surprised at how knowledgeable Chelsea was throughout the process and how affordable the end result was, considering all the value I received in exchange. S: Looking down at it on my hand every. single. day. I love everything about it. I love everything from the fact my man was able to add in details that were important to him and have therefore become my favorite elements of my ring, to the gleaming elements that I told Chelsea I loved - like the rose gold band and the oval shaped diamond - to the fact that one of my dearest friends was the mastermind behind the whole thing! K: I love that I got to hand pick Sarah's diamond. I even got to touch the bottom side of it, which Sarah can never do now that it is mounted, and it drives her absolutely crazy. S: We met while studying abroad in Luxembourg. On one of the first nights there, a large group of us went to the Schueberfouer together and I remember this kid had a bee crawl up his shorts and sting him. My friend and I laughed at and mocked him the rest of the night. I later found out that kid was Kyle. K: The first time we really hung out was one night at Das Boot and her and I got into a passionate discussion about pretzels. She argued they're gross, and I told her she's wrong. I've been telling her she's wrong ever since. S: Kyle and I disagree on this, but we had a drunken night in Prague that led to a hungover morning. We went to Hooters for breakfast because we didn't know where anything else was, and Kyle ordered bottle service for the table so we could retox to detox. Just go with the gelato story. K: I made her miss an important meeting to go eat gelato with me. It took a lot of convincing, but I finally agreed to go. S: Kyle takes me to this driving range/batting cage place in Cleves called Little Fenway Park. Neither of us are particularly great but we make little bets to see who can get a ball to land on the island first. Neither of us ever have. K: Sarah and I go hiking in the Miami Whitewater Forest whenever we get the chance. It is one of our favorite outdoor activities. Afterwards, we always make a pit stop at the Lil' Goodie Shop on Harrison Avenue. Best swirl cone with chocolate sprinkles around. Sometimes, we don't even do the hiking part. S: Fat Ben's Bakery. That's the only one I care about. K: We really love the craft beer scene that's on a constant uprise in Cincinnati. Obviously one of our favorites is Rhinegeist, hence picking it as our wedding venue. We have also made it our goal to eat at every single local greasy spoon at least once. S: A full day of outdoor time with our cow, Loki, on one of our favorite trails during the day, and snuggled up watching a movie with a bottle of wine at night. K: Perfect date day: Taste of Belgium Chicken & Waffles for breakfast, Dilly Deli Chicken salad sandwich for lunch, McCormick and Schmick's for dinner, Sotto Ricotta donuts for dessert. Lots of sun and cabrewing time in between.